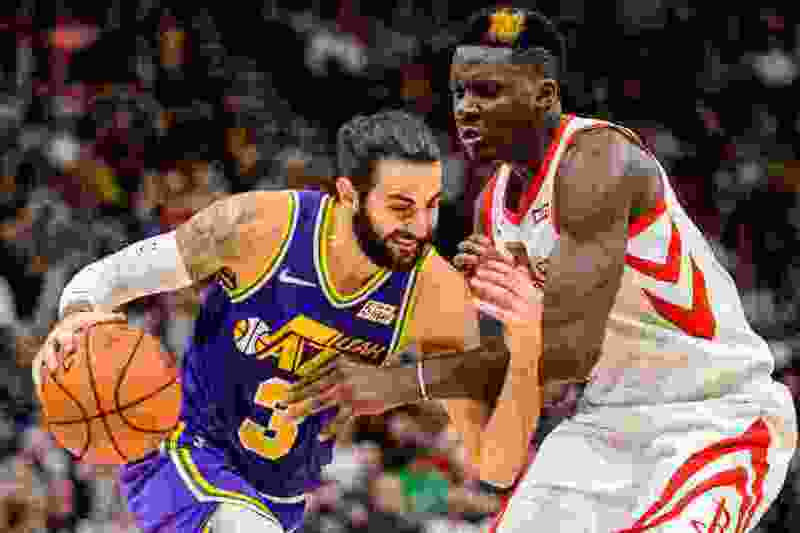 (Trent Nelson | The Salt Lake Tribune) Utah Jazz guard Ricky Rubio (3) and Houston Rockets center Clint Capela (15). The Utah Jazz host the Houston Rockets, NBA basketball in Salt Lake City on Thursday Dec. 6, 2018. He didn’t start. He wasn’t the first or second sub off the bench. But when Ricky Rubio checked into the Jazz’s 109-104 loss to the Blazers on Monday night with 4 minutes, 15 seconds remaining in the first quarter, it was still a big moment. It was his first game action since straining his right hamstring exactly two weeks previously in Milwaukee. It was also the first time the Jazz had any of their three point guards active for a game since facing Orlando on Jan. 9. In making the announcement of Rubio’s return pregame, coach Quin Snyder said Rubio’s minutes would be limited for the time being, and that was certainly the case against Portland. Upon checking in, he played a stretch of 6 minutes and 34 seconds, and got off to a rough start, missing his first shot — an open 3 — and committing a pair of turnovers in quick succession, the second of which caused him to smack the padding on the basket stanchion after he simply lost control of the ball driving in. In all, he played 13:38, made 3 of 6 from the field — including 1 of 3 from deep — and hit 5 of 6 from the foul line. He totaled 12 points, two rebounds, two assists, and a steal, but also had four turnovers. Rubio conceded he was more at ease as the game went along, and said he felt like he could have played more, but understood why he didn’t. Rubio’s rhythm was clearly off early — as he overdribbled around the perimeter, threw a lob pass too high for Rudy Gobert, and generally struggled to locate his teammates for open looks. In the second half, he found a bit more success going the hoop, which translated into trips to the free-throw line. Overall, Snyder said he was pleased with the guard’s performance.